Zongzi ([tsʊ̂ŋ.tsɨ]; Chinese: 粽子) is a traditional Chinese rice dish made of glutinous rice stuffed with different fillings and wrapped in bamboo leaves, generally of the species Indocalamus tessellatus, sometimes, with reed leaves, or other large flat leaves. They are cooked by steaming or boiling. In the Western world, they are also known as rice dumplings or sticky rice dumplings. bakcang, bacang, zang, nom asom, Pya Htote , "Joong", "Doong"
As it diffused to other regions of Asia over many centuries, zongzi became known by various names in different languages and cultures, inclunding Pya Htote in Burmese-speaking areas (such as Myanmar), Nom Chang in Cambodia, Bachang in Indonesia and Khanom Chang in Laos and Ba-chang in Thailand. Vietnamese cuisine also has a variation on this dish known as Bánh ú tro or Bánh tro. 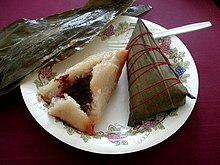 In some areas of the United States, particularly California and Texas, zongzi is often known as Chinese tamales. A popular belief amongst the Chinese of eating zongzi involved commemorating the death of Qu Yuan, a famous Chinese poet from the kingdom of Chu who lived during the Warring States period. Known for his patriotism, Qu Yuan tried unsuccessfully to warn his king and countrymen against the expansionism of their Qin neighbors. When the Qin general Pai Chi took Yingtu, the Chu capital, in 278 BC, Qu Yuan's grief was so intense that he drowned himself in the Miluo River after penning the Lament for Ying. According to legend, packets of rice were thrown into the river to prevent the fish from eating the poet's body. Although they may have originally been a seasonal food, zongzi are available year-round in most major cities with a significant Chinese population. The shapes of zongzi vary, and range from being approximately tetrahedral in southern China to an elongated cone in northern China. Wrapping zongzi neatly is a skill that is passed down through families, as are the recipes. Making zongzi is traditionally a family event of which everyone helps out. Zongzi need to be steamed or boiled for several hours depending on how the rice is prepared prior to being added, along with the fillings. However, as the modes of zongzi styles have traveled and become mixed, today one can find all kinds of zongzi at traditional markets, and their types are not confined to which side of the Yellow River they originated from. "Jiaxing zongzi" (嘉兴粽子): It is a kind of zongzi famous in mainland China and named after the city Jiaxing. The filling is typically pork but also can be mung beans, red beans or salted duck eggs. Nyonya chang (娘惹粽): A specialty of Peranakan cuisine, these zongzi are made similarly to southern zongzi. However, the filling is typically minced pork with candied winter melon, ground roasted peanuts, and a spice mix. Taiwan zongzi (臺灣粽): The northern Taiwanese zongzi (北部粽) are wrapped with husks of Phyllostachys makinoi bamboo (桂竹籜), then steamed; southern Taiwanese zongzi (南部粽) are wrapped with leaves of Bambusa oldhamii (麻竹葉), then boiled. 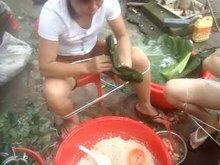 Filipino Machang is a Filipinized version of zongzi, originating from the Hokkien or Min-nan or southern Fujian dialect phrase "ma-chang" commonly used to refer to "zongzi" in local ethnic Chinese communities in the Philippines. Indonesian Bachang is an Indonesian version of zongzi, common among Chinese Indonesian communities. ^ a b c d "The Legend of Zongzi (Sticky Rice Wrapped in Bamboo Leaves)". KCET. June 19, 2015. Retrieved November 5, 2016. ^ Roufs, T.G. ; Roufs, K.S. (2014). Sweet Treats around the World: An Encyclopedia of Food and Culture. ABC-CLIO. p. 81. ISBN 978-1-61069-221-2. Retrieved November 5, 2016. ^ "Zongzi fever". Global Times. June 11, 2015. Retrieved November 5, 2016. ^ a b c d Schmidt, A.; Fieldhouse, P. (2007). The World Religions Cookbook. Greenwood Press. pp. 27–28. ISBN 978-0-313-33504-4. Retrieved November 5, 2016. ^ Thurman, Jim (June 9, 2016). "Where to Find Chinese Zongzi, the Sweet Pork-Filled Tamales Wrapped in Bamboo". L.A. Weekly. Retrieved November 5, 2016. ^ a b c d e f Liao, Y. (2014). Food and Festivals of China. China: The Emerging Superpower. Mason Crest. p. pt68. ISBN 978-1-4222-9448-2. Retrieved November 5, 2016. ^ Jing, J. (2000). Feeding China's Little Emperors: Food, Children, and Social Change. Stanford University Press. p. 105. ISBN 978-0-8047-3134-8. Retrieved November 5, 2016. ^ Mayhew, B.; Miller, K.; English, A. (2002). South-West China. LONELY PLANET SOUTH-WEST CHINA. Lonely Planet Publications. p. 121. ISBN 978-1-86450-370-8. Retrieved November 5, 2016. ^ a b Gong, W. (2007). Lifestyle in China. Journey into China. China Intercontinental Press. pp. 12–13. ISBN 978-7-5085-1102-3. Retrieved November 5, 2016. ^ a b Stepanchuk, C.; Wong, C.C. (1991). Mooncakes and Hungry Ghosts: Festivals of China. China Books & Periodicals. p. 47. ISBN 978-0-8351-2481-2. Retrieved November 5, 2016. ^ "Nyonya Rice Dumplings Recipe (Zong Zi) 娘惹粽子 - Huang Kitchen".